What is the Meaning of PUT ON? I put on a sweater and went outside. Put your socks on before you leave the house. I put on lipstick before I went to the restaurant. You should put your new perfume on tonight. play a movie, CD, etc. You can put a movie on once the kids go to bed. She put on her favourite song and began to dance. Why don’t you put on some nice dinner music? She put this festival on all by herself. This play was put on by the community centre. I have no idea how to put on a fundraising event. My co-worker is going to put on a baby shower for her friend. 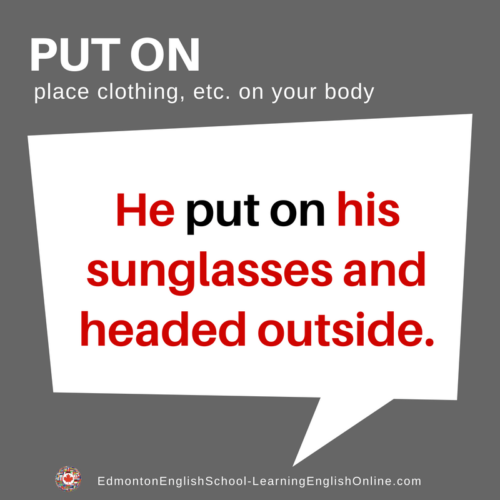 Note: Many phrasal verbs have more than one definition. All the definitions for PUT ON are not included here.